You can get everything you see for $80, or for $40, $20, and $20 with the Starter Set and two Expansion Sets. The Toy-Con VR Goggles are the key item here driving the price of the Starter Set, and they're crucial for the rest of the article. I could make a lot of snarky remarks about what the new Toy-Cons are (does the target audience of the Labo even know what a standalone camera is? Or do they only know the camera on a smartphone? ), but as my caption suggests, the Toy-Con VR Goggles is the real evil here. You need it to operate all of the other Toy-Cons, since that's where the Switch actually goes. Inside that. Coming two weeks from now will be an update to The Legend of Zelda: Breath of the Wild and Super Mario Odyssey. It's the latter I wish to focus on. Besides the failed hare, what do you notice there? 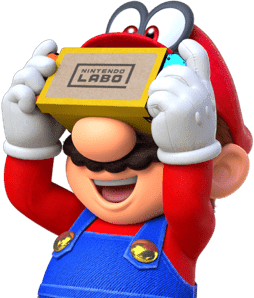 Well, the video depicts you using the Labo's VR Goggles to... watch Mario run around and do his standard Mario activities. 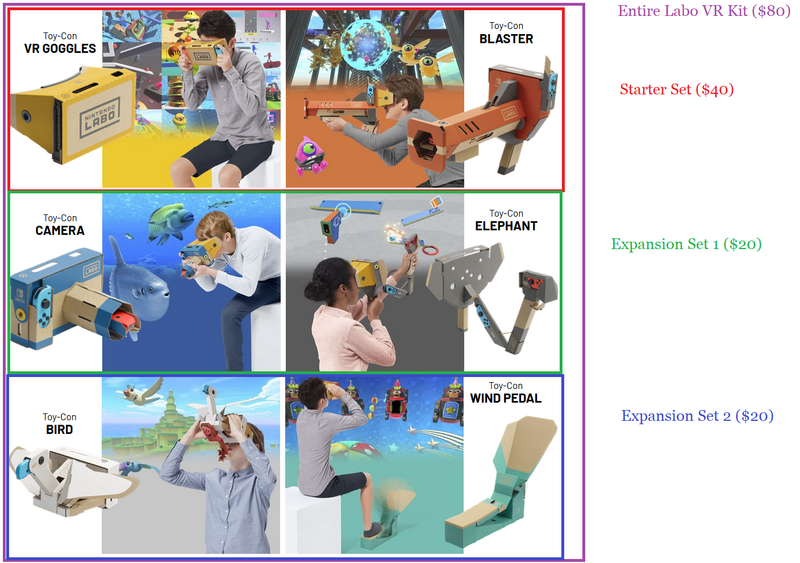 Unlike almost every (or every) VR application, including the minigame activities that come with the Labo VR Kit, the VR Goggles integrated with Super Mario Odyssey portrays a third-person perspective. Instead of a first-person one. Why is that? Because the VR Goggles is putting you in an ethereal perspective of your spirit that was kicked out of their own body. Cappy belongs to the Bonneter race that specialise in capturing/possessing other beings. However, capturing someone's body and then exerting full control over their body are different skill sets. Bonneters excel at the former... but what happens when the victim's spirit can remain in the body? They can fight for control and kick Cappy or other Bonneters out. That's how, after a brief stunned period, captured victims regain their senses once Cappy leaves them. The spirit is close by enough to regain control. This is where the Nintendo Labo and Virtual Reality kick in. Virtual Reality can transport a restless or uncooperative spirit... to another reality altogether. Mario isn't much of a thinker to begin with, so he can use Virtual Reality just fine. ...Anyway, this is extremely definitive evidence of the Cappy-Labo-Mario alliance that I've been talking about for a year. That's a very useful combination of powers, isn't it? The Bonneter captures the body, and the Labo sends their spirit away so the Bonneter can fully control it. And that's the essence of their alliance. It's complementary and serves mutual, evil interests. The Nintendo Labo VR Kit exists to get your mind not only off productive endeavours... but to get it off altogether. Gone. ...If you're wondering where your spirit goes while it's in Virtual Reality, it's apparently going to the sky. That's the truth of the matter. And that's why you get a headache when you use any Virtual Reality device. It's threatening your very spirit from your body. Too much exposure and you'll have a big problem. The issue with the Labo VR Kit is that, unlike other VR devices (well, as far as I know), it's inherently malicious and is actively trying to screw with your mind. As opposed to being a design flaw. What can you do? Don't buy the VR Kit. 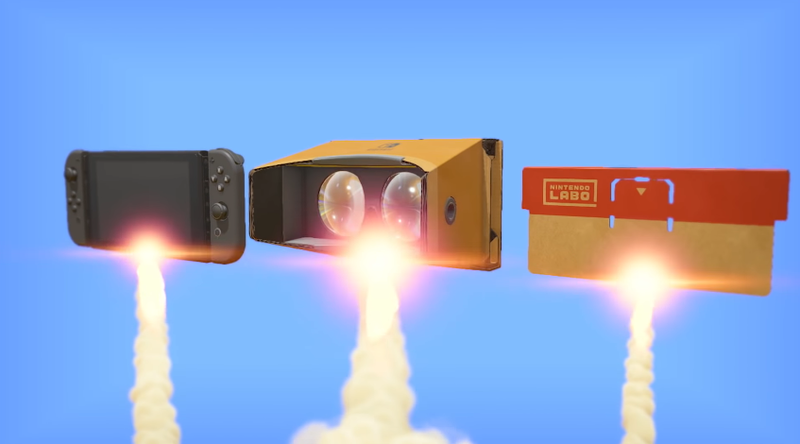 Like any other Labo, it can take over cardboard objects and engage in mayhem, or steal your vehicles. Save your money. Instead of transporting your mind, you can sharpen it by buying Phoenix Wright: Ace Attorney Trilogy on all major platforms for $30. You'll still have more than enough money to save for Phoenix Wright's Challenger Pack in Super Smash Bros. Ultimate! Ludwig can hyperlink you to much more anti-Labo and anti-Cappy literature than what is already contained in this article, since he's been writing about their evils for years on the site and is way ahead of the curve in this regard. This affects much more than just Koopa Kingdom, but your own livelihood as well, assuming you're not a Koopa. As an aside, I wasn't aware of any updates coming for Breath of the Wild (still my favorite recent game with Odyssey a close second) so I'm grateful to you for mentioning that. Thanks! The update only [is known to] affects the compatibility with the Virtual Reality Goggles from the Labo. So it makes no difference to you because you're obviously not gonna get the VR Labo. Right?! I can confirm the Wii U version won't get anything in Virtual Reality. It's... SAFE!